It’s Friday, and down here in Dallas it’s a hot one! According to iPhone, we’re topping out at 102, but with my car claiming 105 and my plants jumping ship, I knew we needed to end the week with a sweating glass of a summertime classic. Last week I escaped to the air-conditioned inspiration of the rock store, today I’m beating the heat with frosty cocktails! 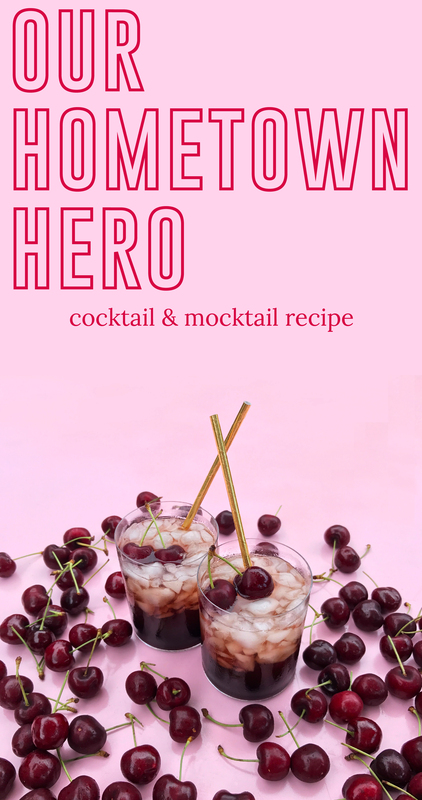 This spiced cherry cola cocktail, our “Hometown Hero,” is an homage to our original hometown hero, Dr. Pepper. Though Dr. Pepper was created in Waco, Tx (and you can read all about it here), it moved to Dallas in the 1920’s and is headquartered here today. In the 1940’s my grandmother lead tours at HQ, always ending with a frosted glass of this unique soda. Though Dr. Pepper did inspire this icy, rum-optional treat, I did not crack their top-secret formula, and super fans should not be disappointed when their first sip is not 100% duplication. Wacoites, to preserve the peace, you may also consider this your hometown hero, so crack open the rum and let’s start cooking!